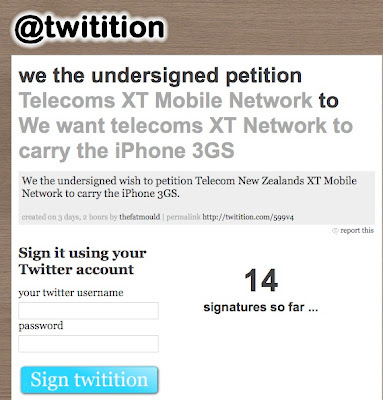 Some bright sparks have launched a petition on Twitter to persuade Telecom XT to have the iPhone. From what I understand the difficulty is all on the Apple side. Personally I would much rather they used their considerable marketing budget to sort out how an SME or single user, without a networking degree, can sync with a Blackberry server. But that's me. However, that's not my main interest in this story. I'm much more curious about the idea of using Twitter as a petition tool. Sounds like a great idea in principle, although I suspect, if it takes off, and there is every reason to suppose it will, our Twitter accounts will be infested with the things. 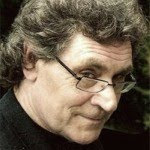 In short, if you have a bright idea, or a burning question or response, and are looking for people to join in with you - see Hamish Keith's Simple Super City, as an example, then I think you need to get in quick. How do you set up a Twitter petition? Setting one up seems to be easy enough. You go to twittion.com , and start one. You will need a Twitter account of course. There are currently 500 twititions on view, signed by 30,640.